Walking that way turned out better for Aerosmith than Run-D.M.C. It’s 1986, and Run-D.M.C. is hip-hop’s hottest act, on the verge of releasing its masterpiece “Raising Hell.’’ Yet pop radio is still too scared to play the group’s music. 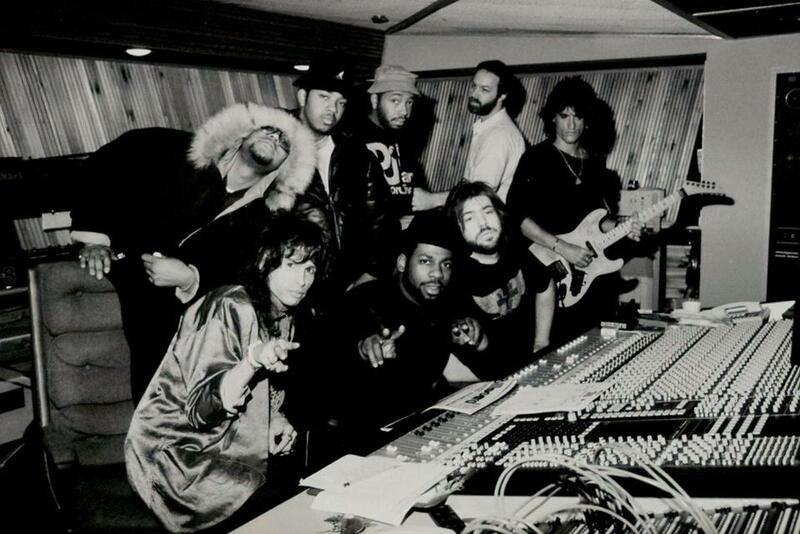 Run-D.M.C.’s metalhead producer Rick Rubin has a brainstorm: Why not remake Aerosmith’s proto-rap classic, “Walk This Way”? As a duet between the Hollis crew and the Bad Boys from Boston? Everybody hates the idea. Run and D.M.C. listen to the song and complain, “This is hillbilly gibberish.” But “Walk This Way” blows up into a Top Ten hit, finally blasting rap into the mainstream and virtually reviving Aerosmith from the dead — but marking the beginning of the end for Run-D.M.C. As Washington Post reporter Geoff Edgers tells the story in his fascinating chronicle, “Walk This Way,’’ it’s more than a hit song; it’s a cultural collision between rap and rock, black and white, past and future. By all accounts, nobody thought they were making history. Each crew showed up for the “Walk This Way” session clueless about the other. Run and D.M.C. hadn’t bothered to learn the lyrics. Steven Tyler and Joe Perry spent much of the session ducking into the bathroom for chemical refreshments. Each side thought it was doing the other a favor. Edgers treats this like a cultural detective yarn, doing valiant gumshoe work. He talked to everyone involved (with obvious exceptions like the late great DJ Jam Master Jay, shot down at his own studio in 2002). He tracked down players like Eddie Martinez, the mysterious guitar hero from Run-D.M.C.’s “Rock Box,” and pioneering female MC Sha Rock of Funky Four Plus One. “Walk This Way’’ is also a study of team dynamics — the way prima donnas keep elbowing for a bigger slice of the credit, whether it’s Tyler claiming he taught Joey Kramer the “Walk This Way” drum part or Run insisting he told D.M.C. to start wearing glasses. Indeed, one of the book’s running themes is the show-biz affliction of “LSD,” or Lead Singer Disease. Edgers devotes a very funny chapter to Tyler’s preposterous claim that he came up with Kramer’s beat. Kramer was always the one who brought the funk in Aerosmith; before he joined, he drummed for an early incarnation of Massachusetts R&B legends Tavares. (You remember: “Heaven Must Be Missing An Angel.”) No doubt Tyler sincerely believes he conceived of the drum part; he also probably sincerely believes he composed “La Traviata.’’ Humility has never been one of this great man’s vices, and bless him for that. By now, “Walk This Way” has a weird place in cultural history — a significant crossover work at the time, but soon obsolete. It didn’t have the staying power of Aerosmith’s 1975 original, let alone Run-D.M.C.’s hip-hop creations; it was barely the sixth or seventh best song on “Raising Hell.’’ When the radio goes back to “Walk This Way” now, it’s the Aerosmith version, and when any DJ puts on Run-D.M.C., it’s a rap classic like “Peter Piper,” “Sucker MCs,” or “It’s Tricky.” When Rolling Stone did its comprehensive 2012 poll of the “Greatest Hip-Hop Songs of All Time,’’ as voted by experts from Questlove to Nas to Chuck D, “Walk This Way” not only failed to make the list, it didn’t get a single vote. In a way, it’s a relic from a forgotten culture war — which is why it sounds quaint and dated now, while the rest of Run-D.M.C.’s music still sounds so full of life. But “Walk This Way” ended up doing much more for Aerosmith than it did for Run-D.M.C. It gave the rock dirtbags a second chance — and bizarrely, they didn’t blow it. They got sober and pulled off one of history’s unlikeliest comebacks, still rolling after 50 years of dysfunction. Meanwhile, Run-D.M.C. crashed and burned, left behind in the late-’80s hip-hop Golden Age they inspired. Some insiders, like Lyor Cohen, feel “Walk This Way” helped destroy them. D.M.C. seems to agree, saying, “Me, I wanted to become a Rage. I wanted to become a Cypress Hill. But they kept telling me, ‘Nah, D, you just do what you was doing in ’86.’ ” He bitterly vows he wouldn’t do another album or tour with Run for $200 billion. Would Run-D.M.C. have been better off without “Walk This Way”? We’ll never know for sure. As the old song says, it’s tricky.